Hello LittleRP'ers, thought I would give some info now that things have finalized for the most part. The LittleRP2 will be a real thing shortly, consisting of source files, kit availability, and parts for those self sourcing. 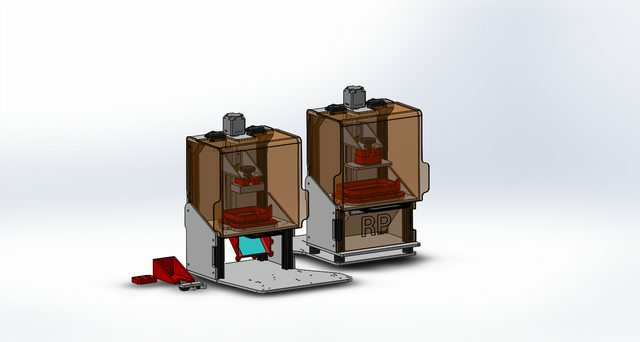 The LIttleRP2 is still heavily based off the LittleRP so that there is an easy upgrade path for those with a LittleRP, the main differences are the width of the machine, the vat design, small incremental changes, silent stepper drivers, astrosyn vibration dampners, hinged hood, no glue hood option, mgn12 and 2mm pitch leadscrew options, etc. The other major addition is the option for increased build area, both in height and in x/y dimensions. There are now options for an extra 100mm in Z height as well as almost doubling the x/y dimensions. The core product is still the smallest of the configurations, the short, small build area, high resolution version. However people now have options, you can change the LittleRP2 from small build area to large build area in a few minutes by rotating the projector base to the rear, installing some spacers, and swapping out the mid plate / vat assembly. The source files will be available at the same time I allow ordering of the kits for those who want to build their own. I will also put together some upgrade kits for those who want to just buy the parts needed to convert. The store will start transitioning away from full kits and offering more components to make it easier for those building their own LittleRP2. I plan on working on modifications to the design in the future, offering LCD support etc. and the wider platform will better allow for this. I am also happy to announce that the LittleRP is now a certified OSHWA ID:US000060 (Open Source Hardware Association) project, I am a firm believer in the Open Source community and would love to support you if you wanted to produce and sell kits yourself. If you have any feedback I would love to hear it. Is there an estimated price point to upgrade from the original littlerp? I just got done assembling mine about 2 weeks ago... glad to see a new version but I'm worried about my wallet. EDIT: The specs look great by the way, and congrats on getting OSHWA certified! It really depends on what you want, I made sure to keep all the linear motion components, tslot, mirror holder, major distances etc. compatible / identical to the LittleRP. So you can definitely do a bit of a buffet where you choose if you want to upgrade anything. The main benefit of the wider frame is to allow a wider vat which has benefits of holding more resin, having a more efficient peel, and allowing for the expanded build area option. Increasing the height of your existing machine would be prohibitive though. Offering such a versatile "a la carte" upgrade option menu shows a great amount of respect to existing LRP owners. You went out of your way to please old and new users alike, a great example to be followed ! I am the proud (second) owner of LRP1 and I 'm eager to start my DLP experiments & mods on a tested platform such as yours. I did not see Raspberry Pi mentioned on this thread, can I have that option with preconfigured NanoDLP? Also, is the homing feature implemented? This all looks stunning to be honest... didn't want to come off as ungrateful or anything in my previous message. I've actually already modified the height of my own littlerp by another 90mm by adding a printed misumi style t-slot and a couple of self designed supports, along with just moving the back plate and side plates up. My next step was to make the XY print surface larger, which is as simple as moving the projector back.... but I would also need to get a larger vat and cut more space in the mid platform, a bigger mirror, etc etc. I'll probably make a little post about it later on, mostly to show off the modular capability of the littlerp more than anything else. How soon are we talking? I have an opportunity to buy a littlerp with a Acer projector that is know to have issues. Is there any specific time line as to getting a 2? @Yianni - nanodlp will be supported but not included, it's still a learning hurdle for most people, so getting up and running with creation workshop is going to be much easier for most people. A Z homing switch has been added at Z max, for either after print homing or setting Z0 pre-print with an offset (useful if not running an underplate). @Redbeard - I likely will be switching out the store products this weekend, this weekend I will verify the BOM again with a build up of each option and document the build steps in a revised guide (the beta guide that exists is 95% the same), and place orders for any parts I don't have in stock at the qty I need. That said I shipped the first LittleRP2 yesterday to a customer who ordered the original kit and I offered to give them the new style, this order let me determine all the packaging for the new model so pretty much ready to go. 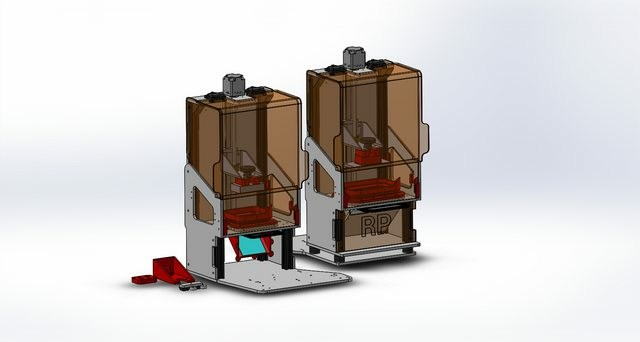 Upgrade kits will happen after the batch of 20 LittleRP2's. I will be emailing my mailing list when kits are available, so if you are interested in those I would recommend signing up (the signup is on the main littlerp.com home page). So your saying if I order a littler kit I'll get a 2????? How would I mark it as an expanded height rp2?